It has been a couple of months since I have shared a fashion post here on the blog. It has just been so cold and yucky that I did not want to go outside without being bundled up like Randy in A Christmas Story! But, now Spring is here and I have received several new pieces from the Aventura Spring 2018 line. I even did a Live unboxing on Facebook to show you what I got and a few ways I plan to style them. 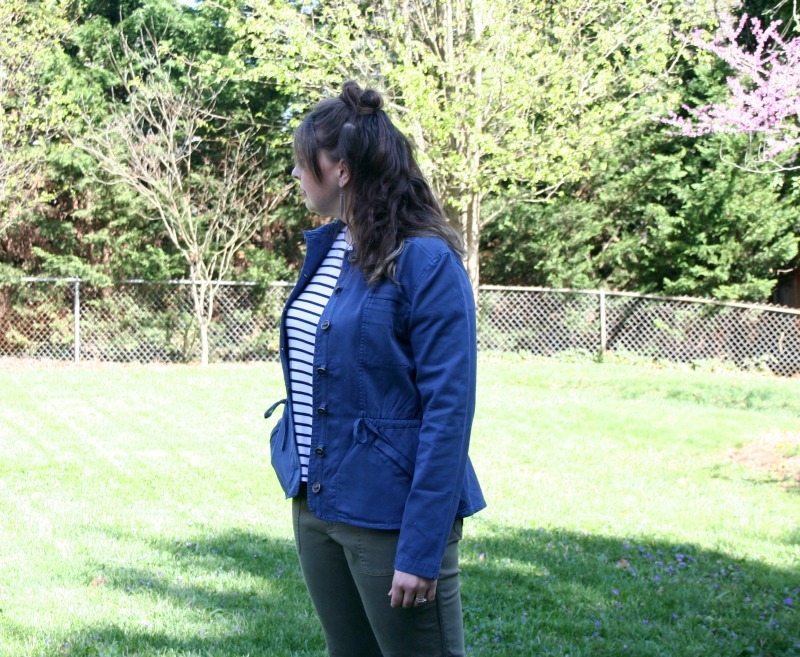 I am joining some of my fellow Aventura Ambassadors to share how we style a utility jacket during this transitional season. 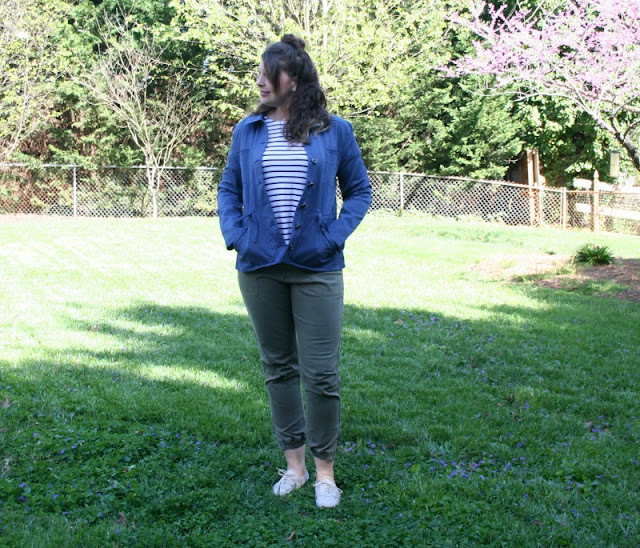 I am styling the Tara jacket with a striped tee and olive green joggers. This time of year, it is hard to know what to wear because it is 40 in the morning, but 70 by the afternoon and my office is usually cold. 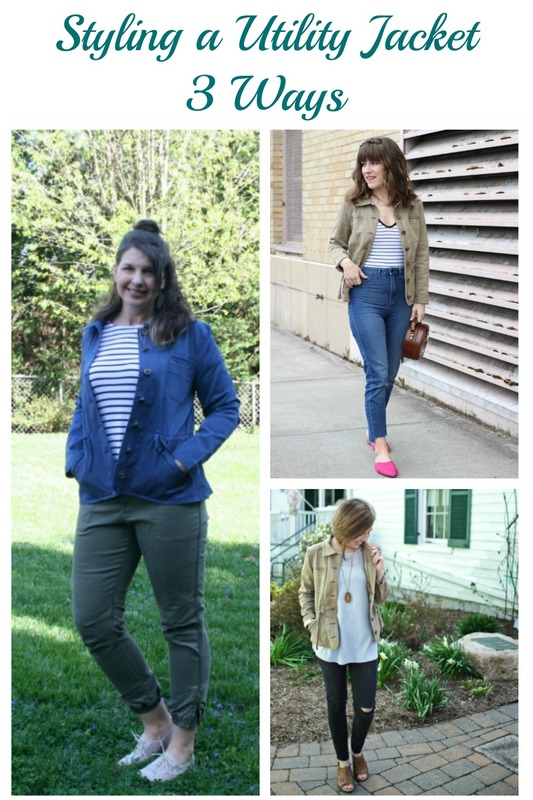 I have been adding jackets and over-sized cardis to my wardrobe the last couple of years because they add a extra layer of interest to an outfit and keep you warm when you need it. 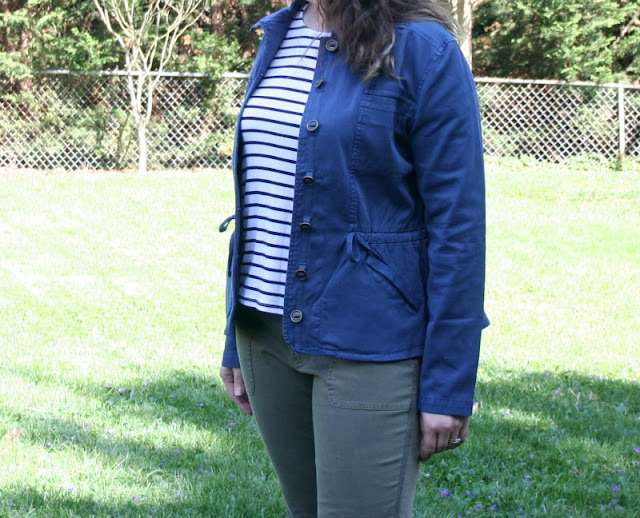 The Tara Jacket is a utility style jacket with a shorter cut and peplum style detail. It is a great jacket to wear with jeans or over a sundress! (which I did on Easter) I love the way the buttons are attached with a ribbon and the tie detail at the waist which gives it a feminine fit. Can we also talk about the joggers for a minute? I finally jumped on the bandwagon and gave them a try. Normally, I need a long/tall length with pants, but since it is spring, I don't mind the cropped look. They are a nice cotton twill fabric and have the cutest zipper detail at the ankles. These will definitely be on repeat so keep an eye on my IG feed for more ways to style them. If you love these pieces and want to try Aventura, use my code RealGirls20 for 20% off a one-time shopping purchase from AventuraClothing.com It can be used for both Aventura and Ecōths clothing – even sale items! Check out what two of the other beautiful Aventura ambassadors are wearing this spring and let me know your favorite look! 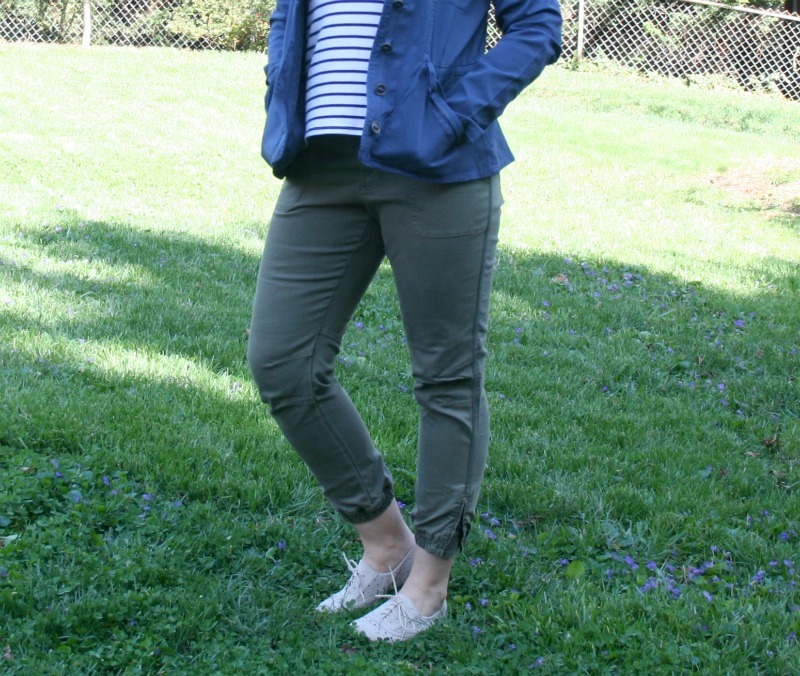 Jamie from Mommy in Flats: "A jacket is the perfect way to break out those summer dresses and dress up jeans and a tee. 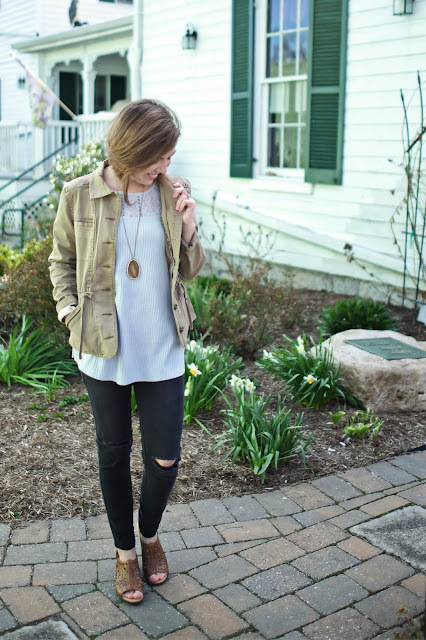 A good jacket is an investment that will stay in your closet year after year, so don’t be afraid to splurge, just make sure it’s a flattering classic style in a neutral color like the Tara jacket from Aventura." 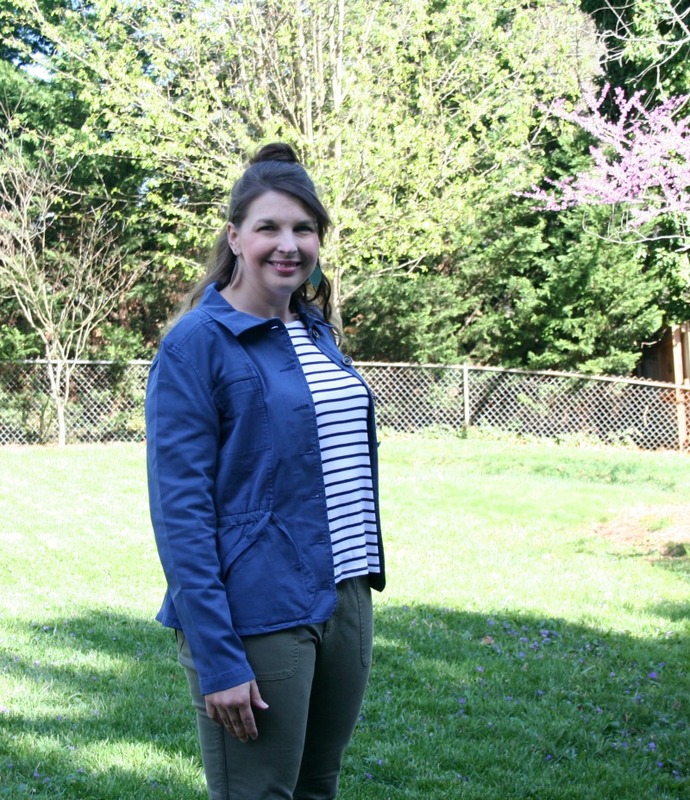 Ruth from My Little Nest: "This Tara utility jacket is my quick grab and go layering option for spring. The jacket is a classic neutral that can be paired with trendy pieces for a chic spring look!" I am glad to be a part of the Aventura family too! I love this jacket! Ada, Thank you so much for always leaving sweet comments! Yes! I love the fit of this jacket. I also love the fact we both chose stripes as our go to spring look! Yes! Stripes go with everything! I love your look too! The jacket is cute! 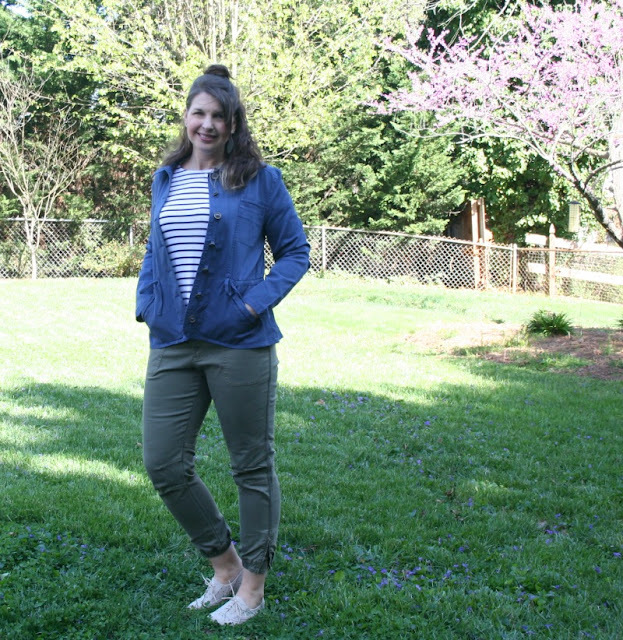 Dressing in layers for spring is a must! Very cute utility jacket! I really like the color and cute peplum detail. Very nice with the striped tee and olive joggers! Thank you! I like that it is a dressier version of a staple.